Posted on 22nd March 2018 by William T.
This machine builds on the performance of the previous generation of RTG to deliver greater savings in energy efficiency, air emissions, noise and maintenance costs. The old super-capacitor system has been replaced by the latest litheum-ion battery technology, which has a much higher energy storage capacity. The Li-ion battery, guaranteed for five years, is associated with a smaller diesel engine, consuming up to 50% less fuel than a conventionally powered RTG, but also quite and easier to maintain. The new Kalmar Hybrid RTG also features a “regenerative” energy system that stores energy generated by braking and spreader-lowering for later use. This platform also offers several advanced features. 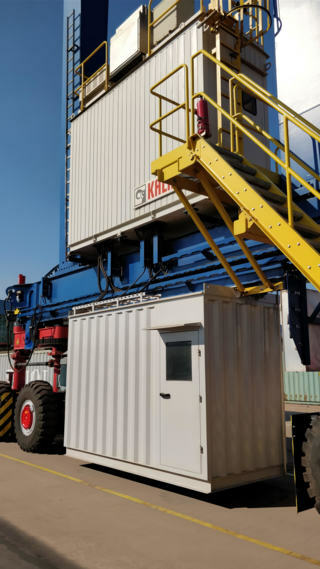 These include an intuitive graphical user interface as standard as well as options such as an electro-mechanical anti-sway system, SmartProfile stack anti-collision system, and SmartView camera system.The Kalmar Hybrid RTG can be customized to meet the precise needs of each operator terminal in terms of height, width and cabin options. Previous PostPrevious JCB launches new range of crawler excavators.